After 3+ years of development, WPTrainMe.com recently launched a new WordPress plugin that gives users instant access to a complete WordPress 'A-Z' training system from their own WP dashboard. 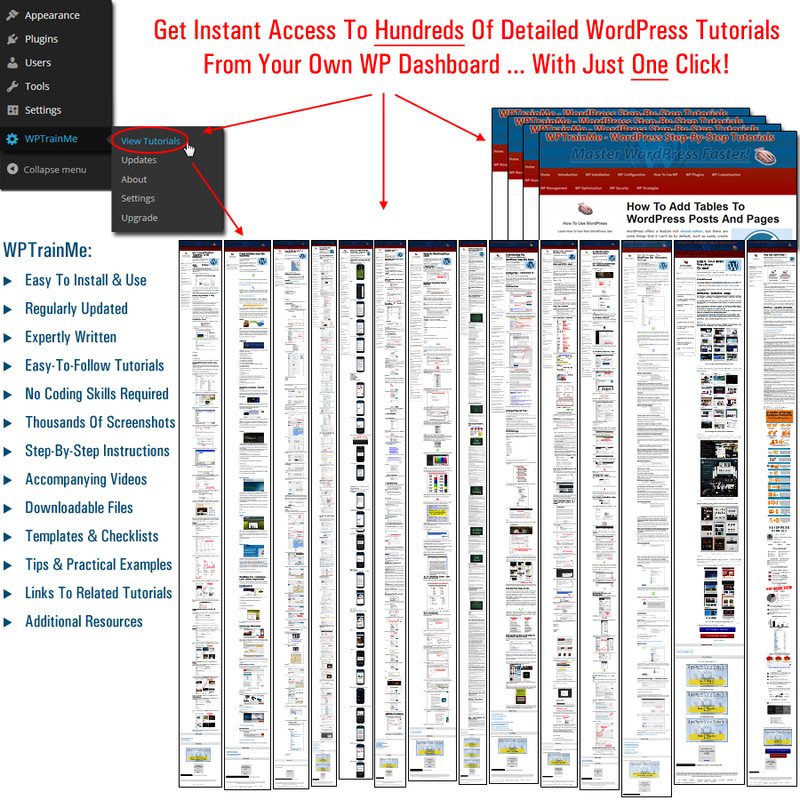 WPTrainMe is the most complete, well-organized, up-to-date and easy-to-follow WordPress "A-Z" training system available! For many WordPress users in need of training, the web is like a huge, disorganized library with books scattered all over the place. "Many sites provide free WordPress tips and tutorials," says Martin Aranovitch, founder of WPTrainMe.com, "but for many WordPress beginners, and especially new website owners, this is like giving someone the keys to a powerful online vehicle and then telling them that everything they need to learn in order to drive it can be found by searching Google. You can waste a lot of time online searching through websites when you want something done, or spend a lot of money paying others to do it for you." Most WordPress 'expert' users are self-taught. While this indicates that anyone can learn how to use WordPress -- the world's most popular open-source content management system and the platform used to power millions of websites worldwide, it also infers that users must spend their valuable time scouring the net for answers, learning by "trial and error". For many business owners, this is simply not a practical or effective way to learn. Fortunately, now there is an easy solution. A simple-to-install and simple-to-use WordPress plugin called WPTrainMe. WPTrainMe is the most complete, well-organized, up-to-date and easy-to-follow WordPress "A-Z" training system available. 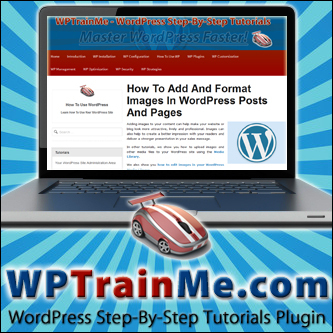 The WPTrainMe plugin installs easily on any WordPress site and allows users to get instant access to hundreds of detailed WordPress step-by-step tutorials covering every aspect of using WordPress from their own WP dashboard. After years of running government and local council-sponsored training workshops showing business owners how to use WordPress and how WordPress can save them thousands of dollars on web development and web marketing costs, Martin realized that something WordPress users seem to be sorely lacking, is an easy-to-follow, step-by-step training system that educates and empowers them to control their own web presence without having to develop the technical skills of a web developer or web designer. "WordPress provides great documentation for technical people like web developers, but for hundreds of thousands of business owners who run WordPress-powered sites and don't want to mess around with editing code, the training that is currently available can be very confusing. Busy people don't have time to sit through hours of videos trying to make sense of how everything fits together ... they just want to get to the point and get things done. Also, many website owners waste time and money unnecessarily because they believe they need the help of experts to get certain things done that they could easily do themselves if only they were shown how. Once you know how to use WordPress and what WordPress can do to help you grow your business, outsourcing becomes an informed choice, not a necessity of doing business online," says Martin, who spent over 3 years meticulously researching, documenting and writing hundreds of detailed step-by-step screenshot tutorials for WPTrainMe. After trying many different training methods and authoring a number of WordPress training e-books, Martin goes on to say that "WordPress is constantly changing, so PDF guides and videos quickly become outdated. That's why I spent months developing a framework for the WPTrainMe system that allows us to keep up with the changes while ensuring that the content will remain organized and easy to access as more tutorials get added to our growing library." Martin says that a unique benefit of learning WordPress with WPTrainMe is that it was created for users not web developers. "I have written all of the tutorials from the user's perspective, because that's how I experience WordPress. I build businesses online and I want to get things done quickly and inexpensively without becoming a hostage to technology or technical people. I've also invested over 8 years learning how to use WordPress and training others. With WPTrainMe, users can benefit from my knowledge and experience without wasting time and money when they need help with their websites". "WPTrainMe is also a valuable time-saving and 'hands-free' training tool for website developers, web designers, web consultants, webhosting companies and anyone providing WordPress services. All they have to do is install the plugin on client sites and point them to the tutorials menu. Users can then conveniently access all the information they need while they are working in their sites, and learn what to do quickly and easily simply by following the tutorials. All of the training content is hosted on our servers, which makes it easier to keep everything up-to-date, and our framework allows us to continue adding new tutorials to the training modules, which then become instantly available to users in their own WP dashboard via the plugin." The WPTrainMe plugin is available in four editions (Free, Basic, Business and PRO), and the premium versions offer single or multiple user licensing options. For more information about the WPTrainMe plugin visit http://wptrainme.com. WPTrainMe.comWordPress Training Plugin WPTrainMe.com Contact InformationDownload for additional information and contact details.